How is Grout Contained in Mudjacking of Slab Foundation? The containment term is arisen in foundation mudjacking due to bleeding of valuable grout from work area (slab perimeter). In case of grouting to longer distance a thinner grout is used to migrate to a greater area. This thinner grout, in most cases, is escaped from work area resulting an ineffective mudjacking and subsequent resettlement of slab foundation hampering warranty if provided any. To avoid these situations sometimes a thicker grout is used. But sometimes this thicker grout may also escape from designed bearing area. In these situations some methods for containing grouts are adopted. a. Shoring to Provide Containment: sheet piling of suitable materials like plywood etc are used to provide containment. 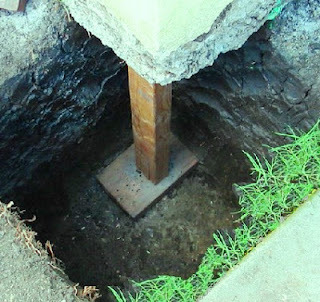 Sheet piles are buried around slab perimeter in to the soil. Bracing are provided to strengthen the shoring system. Necessary sealing is provided not to leak grout at joints between sheets and/or sheet perimeter. b. Intermittent Pumping: intermittent pumping provides a time gap between pumping operations to allow a period to thicken the grout so that it cannot travel much distance to escape from work area. Normally the time gaps are designed using initial set. The repeated application of this pumping and shutting down provides the whole work area to be grouted completely. c. Underpinning: we have discussed many aspects of underpinning in previous post. Underpinning is used here to raise the slab to desired level to facilitate mudjacking without hampering the flow of grout. Sometimes shoring is used with underpinning to have better results.